Thai flood cause revealed: rain! There has been a lot of discussion about the causes of Thailand’s floods: environmental degradation; forest clearing; filled-in water ways; the inauspiciousness of a female Prime Minister; a hydrological plot to destabilise Yingluck; dam management; the revenge of Mother Nature for the excesses of modernity; etc. etc. Some of these deserve further discussion, in particular the vexed issue of managing water releases from dams (a particularly complex issue given that dams serve multiple purposes) but we don’t want to lose sight of the fact that the primary cause of flooding is very high rainfall. The following graphs, which compare the 2011 monthly totals (January to September) with the 30-year averages for those months are revealing. 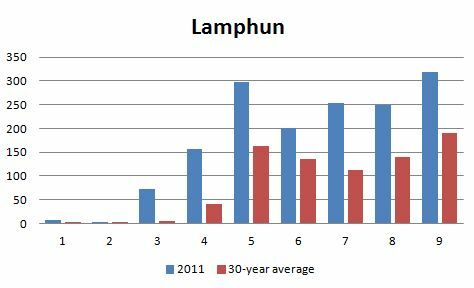 In Chiang Mai the nine-month total was 140 percent of the average; in Lamphun 196%; in Lampang 177%; in Uttaradit 153% and in Phitsanulok 146%. These are only a few locations (and all of them from lowland sites – rainfall is heavier at higher elevations) but they give a clear indication that 2011 has been an exceptionally wet year and that this has been widely spread across the Chao Phaya catchment. But then one has to find the causes for this excessive rain. So one is back to these superstitious explanations. If one is intent to find reasons for damaging someone’s reputation for political gains, nothing can stop them. The rainfall figures are startling, but evidence of contributary factors to this year’s flooding, and last year’s, and the year before that etc, are easy to discern. Canals, no longer much used for transportation, are neglected, and choked with silt and weeds. Highways on embankments criss cross the country, acting as barriers to the natural flow of water. Ever more housing and industrial estates are being built, especially in areas around Bangkok, much of which is in effect a flood plain. It was claimed that last year’s serious flooding in Nakhon Ratchasima was caused, in part, by the construction of a sports stadium in the site of what had been a reservoir! In the rush towards modernisation and “development” Thais have chosen to ignore climatic realities, and they are paying the price. I don’t think anyone would deny that rain this year was higher than last year or than the average, which certainly contributed to floods. But the key question still is: did the rain was so heavy, that it caused this level of floods? Is such a disaster really a normal or understandable, or to be expected, consequence of this level of rain? The issue of dams is indeed quite complex. But, I should remind readers that before a few people, Khun BP for one, started to raise it, most people (I would say) really had no idea that it could be a major cause, or even the cause, of this level of floods. Even now, while there have indeed been discussion of the issue, I would argue that mainstream media in Thailand (and people in the authorities both government and opposition) have not really discussed the issue that much. In this sense, I believe that raising and discussing the issue is really a very positive thing. Of course, this post of Aj. Andrew is very useful, but I don’t think that the ironic title of the post is quite warrant. From this post I suggest we can identify the present WHO to blame for the current disaster. BP’s first mention is of Dr Smith Dharmasaroja, head of the Natural Disaster Warning Foundation. Dr Smith, former head of the Meteorology Department, was appointed to report on the previous great disaster to hit Thailand, the Andaman sea Tsunami. Readers may recall the Meteorology Department failed to issue warnings of the tsunami despite advice it had from the US Geological Survey station in Hawaii. Dr Smith refused to make public his findings saying their release would be harmful to Thailand. I can only surmise that the truth would lead to massive damages claims from foreign people who lost their loved ones. Dr Smith’s organization should be in the business of modeling possible disaster situations, including flood modeling, and advising the public and government of mitigation measures, for example early release of dam water in what appeared from March to be a particularly wet year. He does not name who controls Chart Thai Pattana. But is that not Banharn Silipa-Archa the construction magnate from flood free Supanburi, who when not actually holding the title of Prime Minister has been the effective PM apart from short lived military governments? One might say the permanent PM of Thailand? Last year nature conservationists were horrified at government plans to systematically destroy Thailand’s rivers. Despite public pleas, the plans proceeded and riparian vegetation which protected farmland from erosion was destroyed and rivers dredged to speed waters on their way to quickly flood downstream, and in doing so causing erosion of banks and damage to structures. One wonders if this was part of a plan to divert more funds to construction and private benefit? We notice that even with the floods far from over plans for more dams and drains are miraculously appearing. I agree that this disaster will be a real test of PM Yingluck’s leadership. If she does not heed calls for an independent inquiry run by a panel of experts from out of Thailand, the truth will not come out and Banharn will be continue to benefit from the nation’s suffering. I suggest a panel of inquiry with powers to subpoena witnesses should include among others, experts from Pakistan, China and Vietnam, countries which also have endured great losses from flooding and seen the dubious benefits from damming rivers. China and Vietnam were also named by the UN this year as having increased the areas of land under forest. We have also to ask WHAT is to blame for the extraordinary rains of this year? Climatologists have been saying for a long time now that as the temperature of the World rises, the extra energy in the atmosphere will lead to more and more violent storms and periods of increased rainfall and more severe drought. To combat this effect drastic reductions in fossil fuel use are an urgent necessity, not only for the First World but also for Thailand. This reality shows the rosy picture painted by the three panelists in New Mandala’s recent “Nation (Chart)” discussion to be na├пve and requires, just as the Occupy protesters are insisting, a re-evaluation of economic, social and ethical systems. 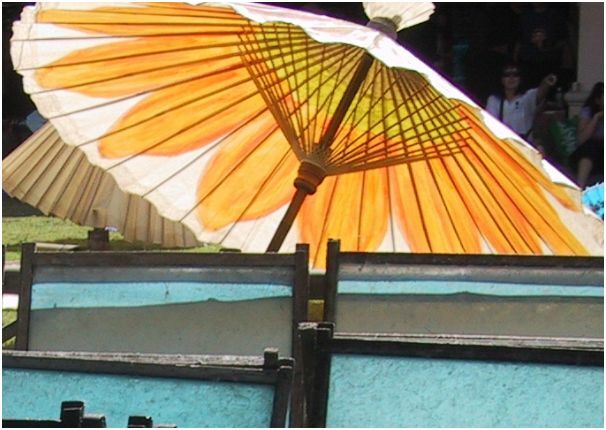 Weather is capricious and changes from day to day, week to week, and year to year, but we had better get used to the new long term reality of increased monsoonal rainfall as the result of global warming. I have lived in Thailand for more than 8 years, and each year has been rainier than the one before. What’s more, there has been an increase in the intensity of the rain when it is falling, and the additional damage it causes has been noticeable. Having said that, I fully concur with Robin Grant’s comments. Most of the tragic losses we are now watching are largely due to the heedless construction of highways, factories, industrial parks, asphalt parking lots, and the general urban expansion of concrete construction on a flood plain without regard to where the water would go. My advice would be to talk to the Dutch. They have a history of knowing how to deal with these conditions. Rainfall, or the amount of water, is certainly one of the most significant variables for floods. However that a flood turns into a disaster is connected to the preparedness of how to cope with it. Here we have a situation in which it seems that no such general emergency preparations existed. Thus, coping with the flood was incremental with little coordination etc. Especially because floods of this scope are not unique or singular events in Thailand, even though they don’t happen every year (may be only once or twice in a decade) why the level of preparedness has been so low? One reason might be that the losses are rather irrelevant for those who would have to make the decisions (and spend money on it). Some people supporting the redshirt cause are astonishingly consistent in a number of issues: pro-modern, anti-NGO and distrust against environmentalism. These issues are interconnected of course: the redshirts are seen as pro-modern themselves, whereas NGOs support traditional ways arguing that these are more sustainable (organic agriculture, community forestry). If the floods were due to “environmental degradation; forest clearing; filled-in water ways; dam management; the revenge of Mother Nature for the excesses of modernity”, then it would give the traditional/moral peasant arguments some credit. Hence the ironic title of the post. Andrew, I think in terms of rain making – a female PM, like the Korat cat (pun intended) is auspicious rather than inauspicious. I wonder why are you interested in only Thai flood, when many countries in Asian have flood together. More industrialization make more loss than agriculterization. Fillipine have more flood than Thailand.No body is interested because of no profit involve that country. Average and current value don’t mean anything without knowing the standard deviation. How much does the rainfall vary by year? For instance, an average person’s weight in Thailand may be 60kg, but I’d hardly call a 120kg person an exceptional calamity who should cause lifts to fall down shafts and floors to cave in. On the other hand, average height is 160 cm, but there are no 320 cm tall people, and if one appeared, I bet they wouldn’t fit anywhere. After Ayutthaya was sacked in 1767, the Siamese moved their kingdom to Thon Buri-Bangkok *as the surrounding areas are flooded during the monsoon season, keeping the Burmese invaders out*. A Bangkok governor once said: *The Burmese don’t come any more, but the floods do*. A Noo NY Mouse – knowing the mean and the standard deviation of data that follows a normal distribution can be useful in predicting the liklihood of a particular value occurring. However, I rather doubt that the normal distribution applies to rainfall data. To get an idea of the variation I suggest you take a good look at the discharge (should read storage I think) data from the Bumipol dam on comment # 6 above. 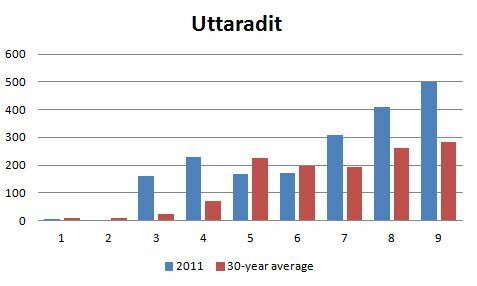 All the graphs from 1993 to 2011 show a steep rise in water stored from about July onwards. For prediction purposes I would suggest a regression on the daily increment which could then be used to determine, when and how much release should take place to avoid a great flood. 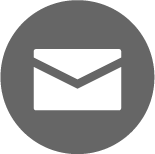 Which governor made the apt comment in Khun Rich’s mail? Sorry, can’t recall the name. It was during the *seasonal floods* in the mid-1980s. The governor was quoted by TIME magazine. Khun Rich, thank you, I was hoping for Chamlong or Samak but they were otherwise engaged in the mid-80’s. I worked in Fortune Town (famous Din Daeng intersection) a few years after that and walked to and from work from my place on Asoke just past the bridge over the San Saeb Khlong on the way back. Often enough the direct route home included going past it to Soi Cowboy then, somewhat later, back up Soi 23 through the campus. More than one evening, the trip would be done in a conga line of hundreds and hundreds of people, the front guy gingerly testing each step, the rest of us grateful to follow, water to the knees, maybe a little lower, maybe a little higher. The high stools were out on Cowboy. I think people have to have faith. People should just come together and do the right thing. Put aside all the politically stuff and focus on what is important. The land and the people in it. WhereisThailand had what I thought was an interesting article on dams and the water behind them which I tried translating. Some of the references are especially interesting. Many people who have looked into the matter claim that dams cause floods, the opposite of what the dam builders say, of course. The Bangladesh Flood Forecasting and Warning Centre is a nice example of what can be achieved for an entire flood-prone country. 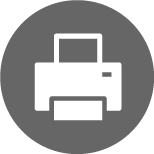 It also shows that important and up-to-date information can be presented clearly. The modelling behind this system has been done by DHI who have also had some involvement in flood forecasting in Bangkok (see this). This is a model for rainfall run-off that occurs in the Bangkok area, so the floods from up-country will not be included. However, the example from Bangladesh shows that this can be done in an integrated manner, which is fundamental when trying to control an entire network of rivers and dams. Dams do not cause floods. Likewise, dams do not stop floods. It is their operation that is the problem. If the system was integrated, then water could be released from dams in a controlled manner to limit the flood peak downstream. This may not stop flooding, but it would reduce the flood extent. Indeed, if a flood forecasting system can be built for the entire country of Bangladesh, then it should be possible to implement one for Thailand. 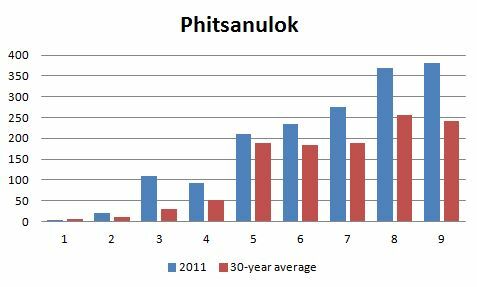 This graph from the Thai Meteorological Department shows the variation in percentage of Thailand’s annual rainfall since 1950 compared to the mean between 1971 – 2000. During six years in the past 30 has the rainfall been higher than 10 percent above average; 1970, 1975, 1988, 1999, 2000, 2008. In only one year (1999) has it been higher than 15 percent. Andrew’s graphs show that the rainfall 2011 has been much higher than 15 percent above the average. There has not been a single year with as much rain since 1950. This clearly suggests that the cause of the flooding is RAIN and nothing else! The graph is also showing that rainfall in Thailand was decreasing from 1950 until the 1980s when it started to increase again. 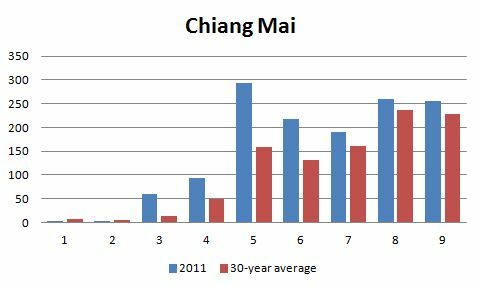 Thanks Crhis, as you will see in my latest post I have attempted a similiar analysis for a long time-series of Chiang Mai data. These floods are an obvious example of climate change, fortunately now that Australia has unilaterally legislated a Carbon Tax, worldwide carbon outflows will decrease dramatically by 0.05% and Thailand just like Australia will never be bothered by floods again. Perhaps a large statue in Bangkok of Julia Gillard surrounded by salivating GS & JPM bankers as she parts the waters of the Chao Praya would be a fitting tribute of gratitude.